Government may Encourage it, but why should I make a Will? The Ministry of Justice has launched its “Choice not Chance” campaign. The aim is to encourage people to make a Will, execute a Lasting power of Attorney and also to join the Organ Donor Register. The latter is not so much a legal issue as it’s a purely personal choice. However, there is still a need to ensure people close to you know your wishes so that there is no delay and can make fully informed decisions if they ever have to make the difficult choices regarding the use of your organs. Such a choice can result in the saving of one or possibly many peoples' lives and sight. In relation to wills, we have blogged about the reasons for making a will previously. The Government’s own reason for encouraging everyone to plan ahead is that firstly it “will make sure that you and your family are protected if something happens to you in the future”. This encapsulates both the reasons for having a Will but also a Living Will and Lasting Powers of Attorney, often shortened to LPAs in a nutshell. “...lets you decide what happens to your money, property and possessions after your death. This has all sorts of implications for your children, particularly those from previous relationships and your partner. It is also important to re-visit your will every 2 years or so to ensure that changes to your life, for example retirement, a marked rise in the price of your house, the arrival of a new child or grandchild is reflected in your arrangements. Another implication for example that many people do not know, is that on marriage a previous Will is normally invalidated. Also, if you separate but do not divorce until the decree absolute comes through your spouse remains as a beneficiary. On divorce he or she will be treated as if they had died at the date of the decree absolute but even then it is possible for them to come back. Wills seem, but rarely are, as simple as people might imagine and so as your circumstances change it is important your Will changes or you make your first Will to ensure those you love benefit in the way you would want them to. • In the year 2009, 46% of the people who died did have a Will. This means 54% did not have a Will. A further statistic is that 75% of the qualifying population either do not have Wills or need to review existing Wills. • There is no legal obligation to make a Will. It is easy to put off making a Will. If you do not make a Will the Government will decide who inherits your money, property, and possessions. • Anybody can make a Will provided they are at least 18 years of age and of sound mind. There is no maximum age limit for making a Will. Additionally if a person is a serving soldier or sailor on active service, a lower age limit of 14 applies. i. You can decide exactly who gets what. ii. You can decide who should be responsible for winding up your estate. iii. You can make attempts to mitigate your inheritance tax bill. iv. You can appoint guardians for your children. v. You can make attempts to reduce possible care home fee charges. vi. You can create a Will Trust to protect your assets. vii. You can set out your funeral arrangements. • You should start thinking about making a Will when you enjoy new found wealth, get married, are in a civil partnership or when you have a baby. The need to review arises on divorce, when you have another child; there is a death in the family or your estate changes. There are many other examples. • When a Will is made you can store the Will for safekeeping with us, for your lifetime free of charge. We can also register it in a National Will Register with Certainty.co.uk. It allows a Will to be found instantly on death. If you have any queries about making a Will, an existing estate or you are an executor or administrator with a query about carrying out your role then please contact our Private Client team who will be able to help. For more information, visit The Ministry of Justice for their view on why you should have a Will. 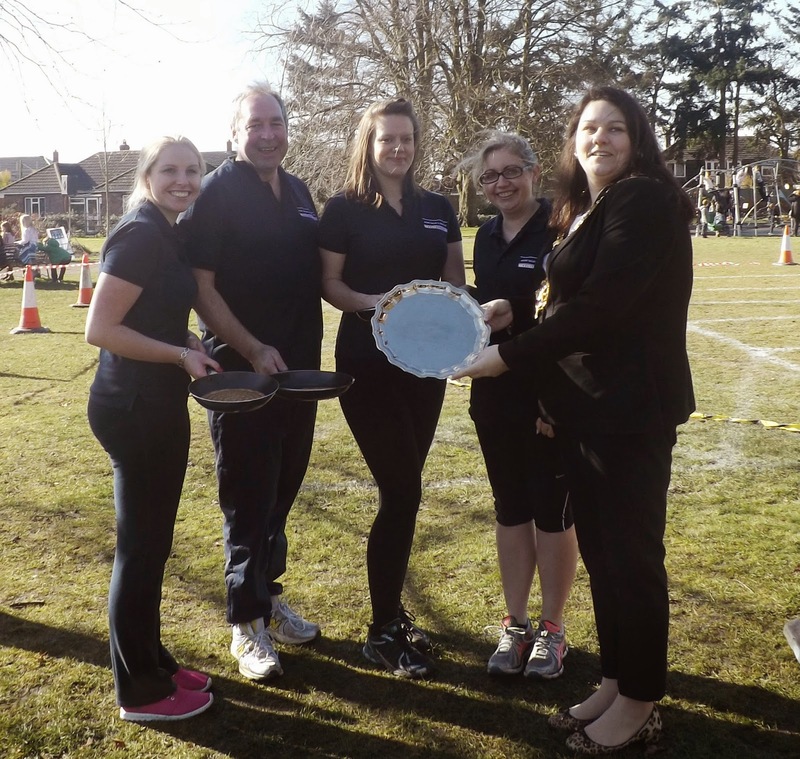 DEVIZES PANCAKE RACES - IT’S THE TAKING PART THAT COUNTS! Hillworth Park was busier than usual yesterday lunch time as happy onlookers eating warm pancakes, cheered on the teams that entered the Devizes Pancake Races. This fun event is held annually on Pancake Day and is organised by Age UK Wiltshire. The Mayors Salver Challenge Race - when the going gets tough the tough get going! February weather isn’t exactly warm although the sun was shining but soon “heated up” more so when the relay race began! It was a tough race against the other teams who had also entered: Hillworth Park Trust, Goughs Solicitors, the Gazette and Herald, Age UK Wiltshire and The Black Swan. This race was definitely going to be a challenge if ABD were to win the Silver Salver. ABD faced some stiff competition but eventually came through to win with some excellent tossing on the run from Samantha-Jane Walters who ran the anchor leg! Good team work and smooth handovers was the key to ABD Team’s success. No one managed to drop the pancake either! As well as ABD team taking part, other local businesses took part too making it a great community event! Well done team to ABD team for taking part and supporting a very worthwhile community cause. Donations were gratefully received by Age UK Wiltshire for this event. All profits from this event go to Age UK Wiltshire to fund their work with older people. More Information regarding this event? AN INTERESTING CASE - TAKING ADVICE AT THE RIGHT TIME HELPS! The case involved a homosexual unmarried couple (Mr X and Mr Y) who intended to buy a house together in 1999. Unfortunately, due to Mr X’s ( Peters client) mental health problems they could not get a joint mortgage whereas the client’s partner Mr Y could do so in his sole name. Hence the house was bought in his sole name but there was no declaration of trust or restriction put on the title to record Peters client Mr X had an interest and therefore protect his interest in the property. They were together for more than 24 years when the partner died suddenly of a heart attack leaving no will. The couple were not in a civil partnership which meant that under the Intestacy rules Peter’s client received nothing from his late partner’s estate. Peters client Mr X who is now 52 had not worked for many years and faced the rest of his life on benefits with a very meagre income and poor quality of life . The deceased’s family claimed that their son Mr Y was not gay and denied (despite there being overwhelming evidence to the contrary) that there had been any relationship between the two men and so they told him to leave the house that had been his home for 16 years. A claim was made that Peters client either had a beneficial interest in the property, alternatively that the Intestacy rules failed to provide reasonable provision for him under the Inheritance (Provision for Family and Dependants) Act 1975. When Peter first set to work on this case both claims were denied in their entirety in particular so following the issue of Court proceedings the parties went to mediation and as a result a settlement was reached whereby Peter secured Mr X £55000 including payment of his legal fees. He was a very happy man and after what was a very sad time for him after the death of his life long partner can look forward to the rest of his life.